Understanding why people share stuff in social media is key to unlocking sales in social commerce; social media communicates social influence and social influence creates social sales. 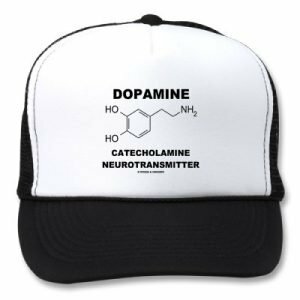 And a new study by Harvard psychologists Diana Tamir and Jason Mitchell has just found out why we share – it’s the mesolimbic dopamine system. Humans devote 30–40% of speech output solely to informing others of their own subjective experiences. Bypassing the neurobabble (read the study here), what the study found was that the area of the brain responsible for outputting the ‘pleasure chemical’ (the neurotransmitter dopamine that makes us feel pleasure) is activated when we talk about ourselves. Which is probably why 30-40% of everything you ever say will be about you. Your Mesolimbic Dopamine System means you get a chemical kick about talking about yourself. It’s also probably why 80% of your social media output will be vanity posts about you. Talking about yourself is verbal masturbation and you’re addicted. You’re hardwired to spread your memes as well as your genes. In a nutshell, the psychologists found this out by getting people to talk about themselves and then about others whilst having their brain scanned (fMRI) and then by getting them to do cognitive tests. Bottom line? Lots of pleasure chemical when talking about ourselves, not a lot when talking about other. And if asked, we’d rather fill out an unpaid survey about ourselves than get paid to fill out a survey about facts or others. In fact, the premium we give on talking about ourselves over talking about others averages out to be $0.63. Our minds might want privacy, but our brains want self-disclosure. So what does all this mean for social commerce? Simple, get people to talk about themselves, not your products. Your product should feature, but it’s the support role, not the leading role. In the world of social commerce, the t-shirt wisdom “it’s all about me” holds true. (thanks to Ed White, from the fabulous Contagious Magazine, for the heads up on this study).